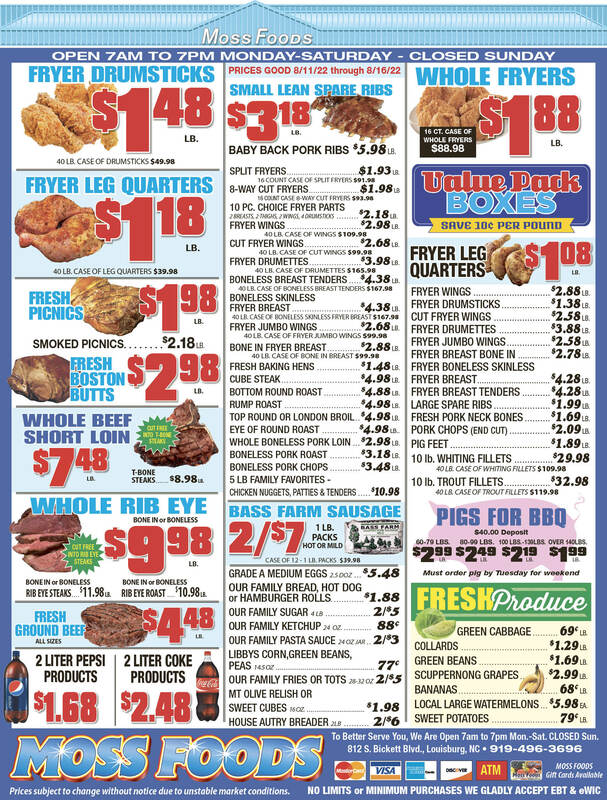 Showing 43 articles from July 16, 2014. Five major positions in Franklin County Schools will feature new personnel following a busy day Monday for new School Superintendent Dr. Lisa Martin. A delegation of parents filled the meeting room of the Franklin County Board of Education Monday night in an unusual display of support for two school principals who were to be assigned new schools. Eight individuals and one school were singled out recently at an honors day in Franklin County Schools. Louisburg Police Chief Rick Lassiter climbs back atop a dunking booth after taking one of several plunges during a community fair at Joyner Park on July 13. Lassiter volunteered his services as part of the Domestic Violence Coalition 24’s event to draw awareness about domestic violence. Liz Guzman helped organize the event and the coalition in remembrance of her daughter, Rosemarie, who was killed in December 2011. LOUISBURG — Investigators are awaiting a completed autopsy, but they’ve acknowledged they may never truly know the cause of an infant’s death that was found buried in a backyard. District Attorney Sam Currin said he will hold out until medical examiners have completed their work. YOUNGSVILLE — When Tim Gray and Matthew Winslow looked at the old brick building at the corner of Main and Cross streets, they saw a great location for office space. 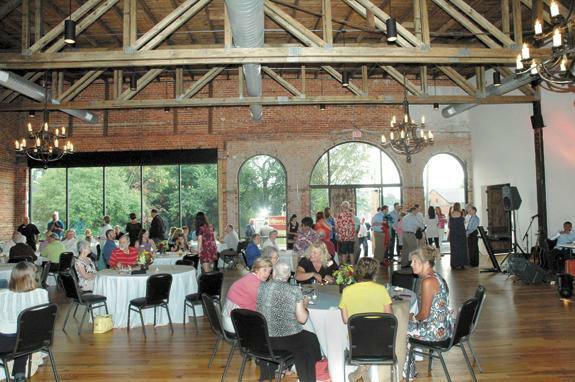 When their wives got a better view of the insides of the 7,200-square-foot building, they saw a great spot for community events in the heart of town. Are we just too dumb to know what’s in our food? Say it ain’t so, G.K.! Our very own — and relatively new to us — congressman is one sponsor of a bill that he and a co-sponsor are hoping to shepherd through Congress this fall. 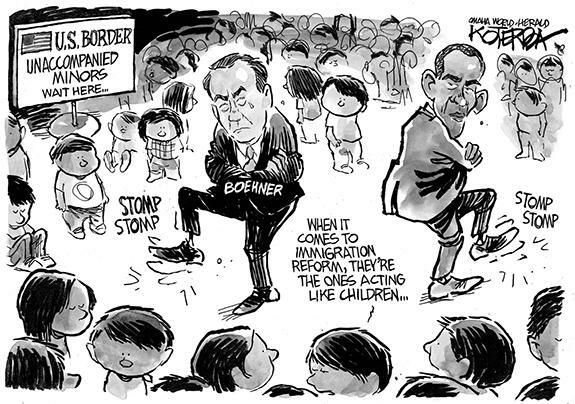 The bill’s sole intent, as far as I can tell, is to treat us all like mushrooms. You know, keep us in the dark and feed us ... well, whatever it is they feed mushrooms. We can only hope that many of our readers are paying attention to the unfolding saga in both North Carolina and the nation regarding highway construction and the ways to pay for it. That is especially true after Franklin County got hammered recently in the alleged “data driven” evaluation of North Carolina highway needs that somehow managed to knock U.S. 401 years, perhaps decades, into the future. Sometimes you can sit in a government meeting for two hours and not have a news story to write. But that does not mean that nothing happened. I had just such an experience on Tuesday night. Okay, so there was one bit of news: Commissioners agreed that they would charge property owners a true meter installation fee and tapping fee. Why handcuff the locals if they really know best? In 1971, Carole King’s album, Tapestry, was released. Both the album and two singles from it spent considerable time atop Billboard’s list; a rare feat. Perhaps rarer is that over 40 years later, the twin hits provide an omen to today’s Franklin County voters. I have written about the dangers of fracking on numerous occasions. I am writing to ask for help in finding out what has happened to my son Roger. He has been missing since July 2009. My friends and I have had searchers and walks and put posters up and got the sheriff’s office to put out a senior alert. WAKE FOREST —Andrew John Jursik Jr., 60, formerly of Flemington, N.J., died Tuesday, July 15, 2014, at his home. 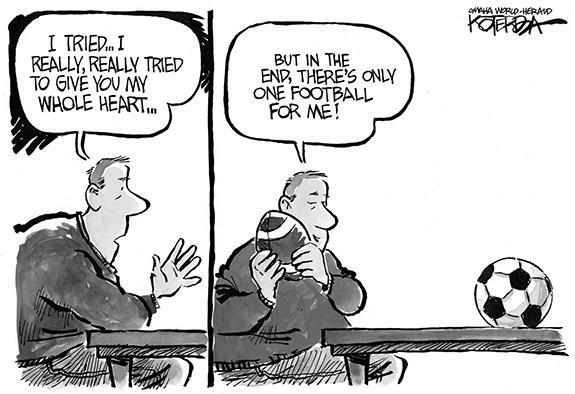 He was born to Andrew J. Jursik Sr. and the late Phyllis Colello Jursik. BUNN - Mattie Geraldine C. Harris, 82, died Tuesday, July 15, 2014 at her home. Funeral services will be held Sunday, July 20, at 3 p.m. at Gethsemane Baptist Church, Bunn. Burial will follow in the church cemetery. LOUISBURG - Peggy Wilder Paul, 80, of Louisburg, died Tuesday, July 15, 2014, at Hillside Nursing Center. Born October 22, 1933 to the late Bern and Syble Hales Wilder. She was preceded in death by her husband, Bert Paul, and her two brothers, Max and Harry Wilder. UNDER THE TAG. 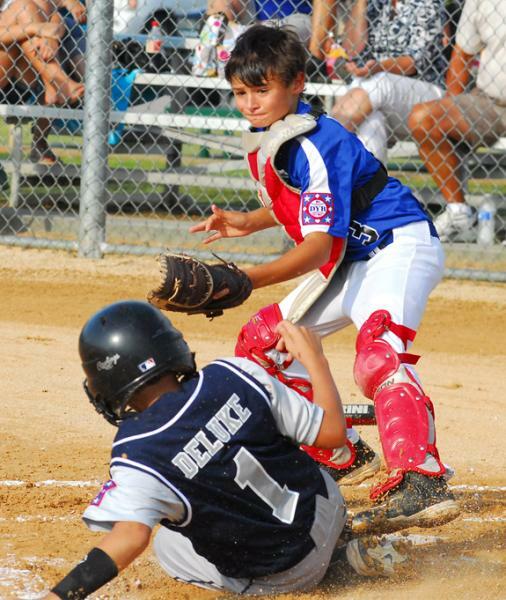 Youngsville’s Joey DeLuke evades a tag attempt from Oxford’s Shane Williams and scores a run for his club during Monday’s championship game of the Dixie Youth Major League District Baseball Tournament in Warrenton. 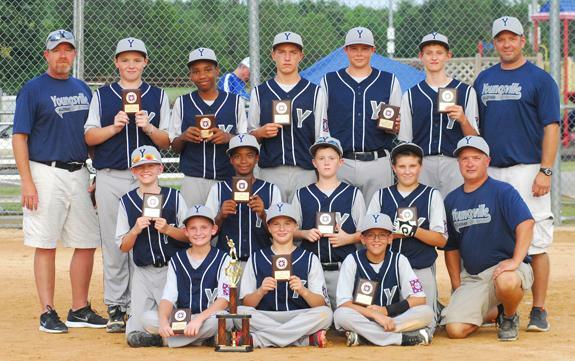 WARRENTON -- As if championships in the Coach-Pitch and Minor League levels weren’t enough, the Youngsville All-Stars went looking for a clean district sweep at the Dixie Youth Major League Tournament. Youngsville was able to finish the three-peat in effective fashion, rolling past its three other foes at the district event at the Warren County Park. 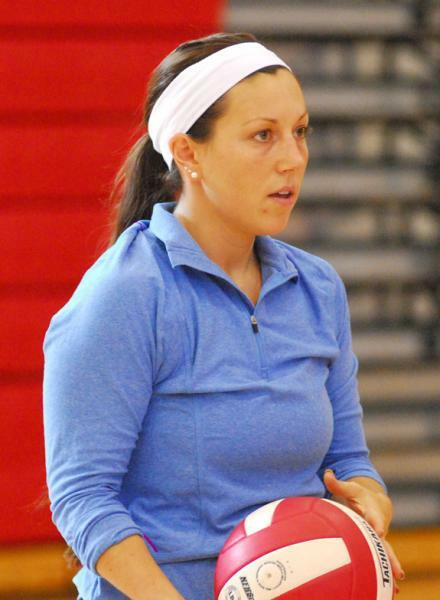 LOUISBURG -- It didn’t take long for Caitlin Withers to make an instant impact when she was named Franklinton High School’s volleyball coach two years ago. During that effective campaign, Franklinton went undefeated on the court against Northern Carolina Conference foes in the regular season -- and FHS followed up last fall by making the Class 2-A State Playoffs for the second straight year. LACROSSE LEGEND. 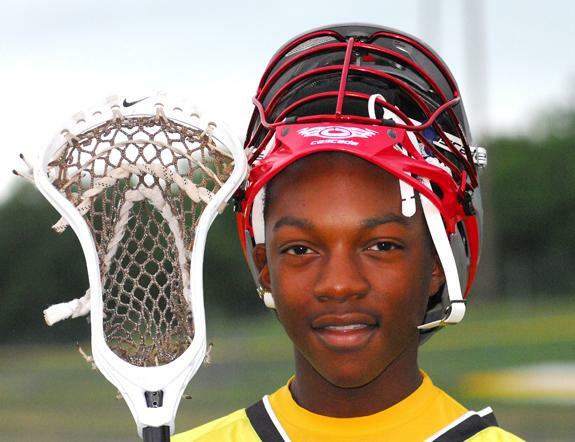 Bunn High School rising sophomore Victor Dunston competed in the 2014 Brine National Lacrosse Classic, which was held June 30-July 3 in Boyds, Maryland. BUNN -- Flash back a few years ago, when Victor Dunston Jr. was in attendance to watch his sister, Victoria, take part in a Bunn Ladycats’ softball playoff game at a rural outpost in Eastern North Carolina. As always, Dunston brought along his trusted lacrosse stick -- and an extra one just in case somebody wanted to play catch. A GREAT SHOWING. 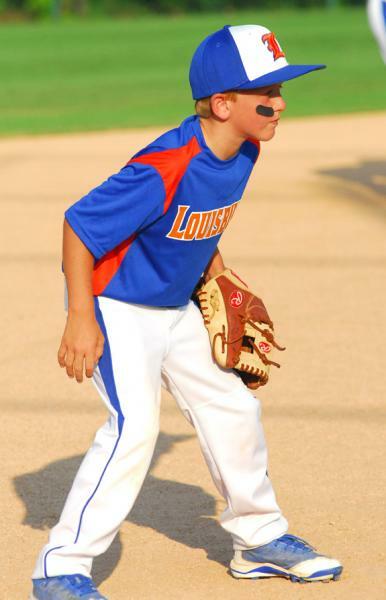 Tyler Douglas and the Louisburg All-Stars earned second place at the Tar Heel Coach-Pitch District Tournament last week in Knightdale. 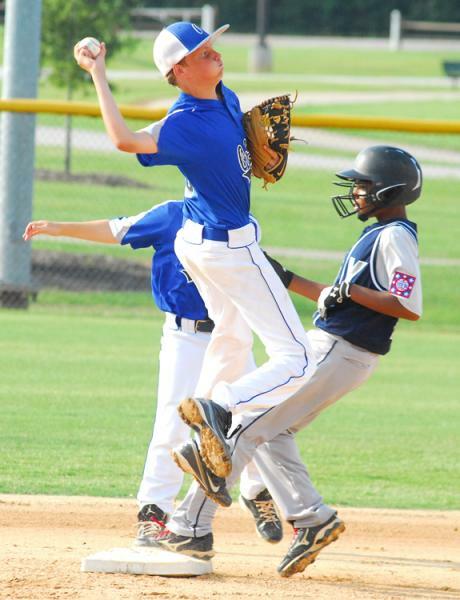 KNIGHTDALE -- After falling into the loser’s bracket after just two games, it would have been easy for the Louisburg All-Stars to fold at the Tar Heel Coach-Pitch District Tournament at the Knightdale Community Park. Plans could have been made for the remainder of the summer, and the thought of competing for a championship at the annual event would have been a distant memory. LOUISBURG -- Cristian Neagu’s success-filled stint at Louisburg College has come to an end. Eckerd is a four-year, Division II school located in St. Petersburg, Florida. LOUISBURG -- Sites have been finalized for the 2014 Louisburg College football schedule. The Hurricanes will open Aug. 30 at home against Jireh Prep at Louisburg High School’s Patterson Field. ZEBULON -- Yandy Diaz and Alex Monsalve belted a pair of sixth-inning home runs to vault the Carolina Mudcats over the Winston-Salem Dash 6-4 on Monday afternoon at Five County Stadium in a Class A Carolina League baseball showdown. The Mudcats (16-10, 45-48) have won four of their last five series after taking three-of-four from the Dash (13-13, 43-52). NASHVILLE -- AIWF/Edge Wrestling will host a card this Saturday at the National Guard Armory in Nashville. The facility is located at 1030 Eastern Avenue. Tickets are $10 for adults and $5 for children ages 5-12. 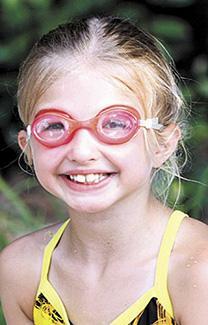 Kids 5-under will be admitted free of charge. Bell time is at 7:30 p.m., and tickets will be available at the gate. 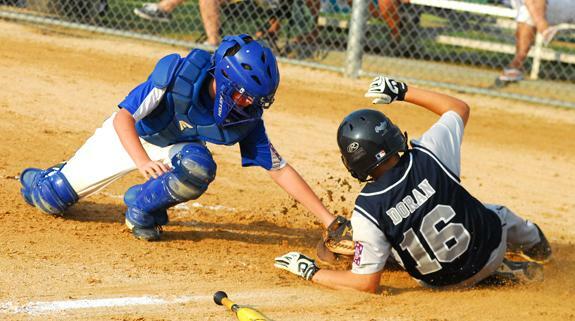 Youngsville’s Adam Doran slides in for another run for the All-Stars during their victory over Oxford in the title contest of the Dixie Youth Major League District Baseball Tournament. 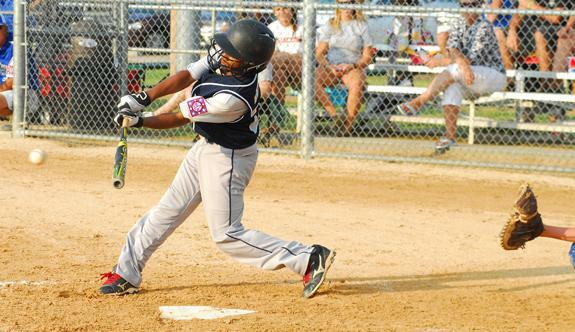 Youngsville’s Robbie Burnett rips a base hit on Monday evening against the Oxford All-Stars. 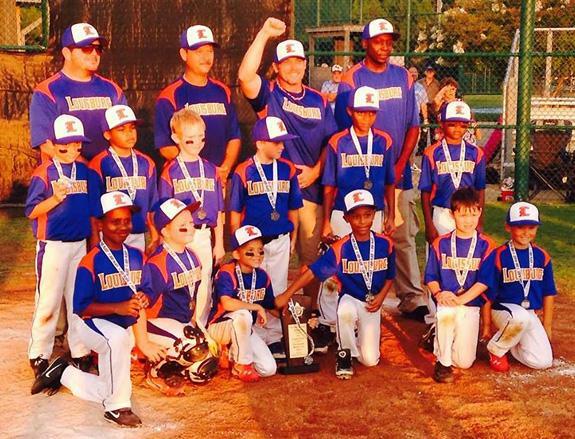 Members of the Louisburg All-Stars pose after the club claimed second place at the Tar Heel Coach-Pitch District Baseball Tournament last week at the Knightdale Community Park. 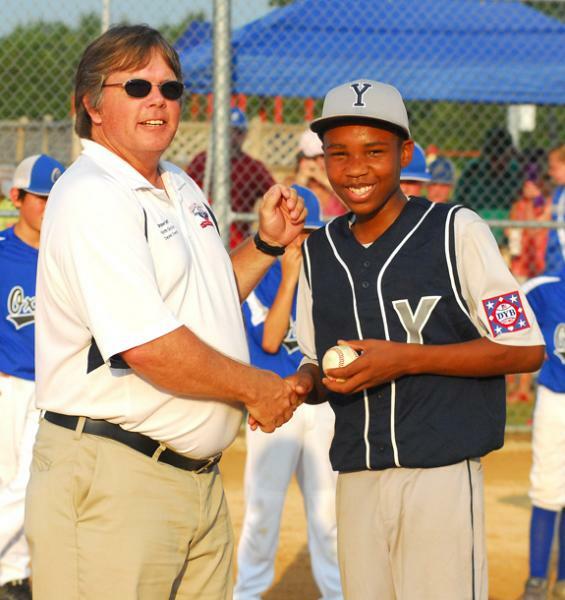 Youngsville’s Aiyon Burrell receives his home run ball from Dixie Youth Baseball District Director Bruce Tant following Monday’s championship game. 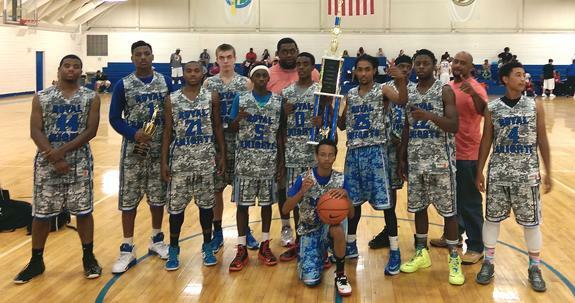 The Franklin County Royal Knights pose with their hardware after winning the High School Division of the Youth Sports League National Basketball Championship, which was held July 12-13 in Butner. Aaron Simmons (second from left) was the MVP. 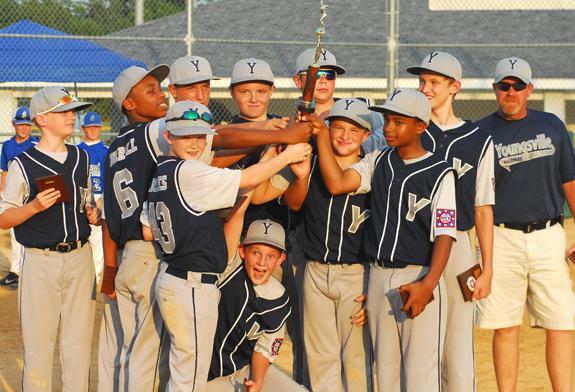 Members of the Youngsville All-Stars pose after winning the Dixie Youth Major League District Tournament Championship on Monday in Warrenton. Chandler Williams pitched a complete-game gem Monday for the Youngsville All-Stars against Oxford in the finals of the district tourney. 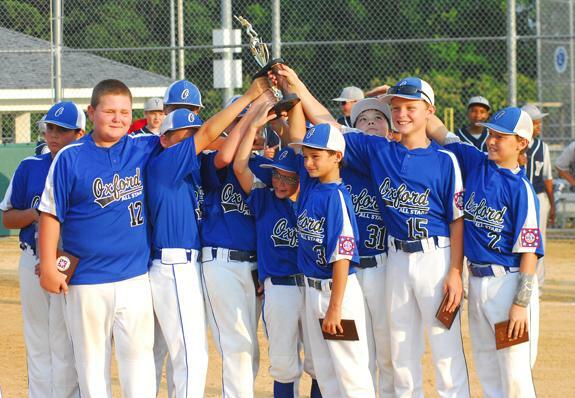 The Oxford All-Stars accepted the runner-up trophy at the Dixie Youth Major League District Baseball Tournament, which concluded Monday evening at the Warren County Park. The Youngsville All-Stars celebrate after winning the championship at the Dixie Youth Major League District Baseball Tournament. 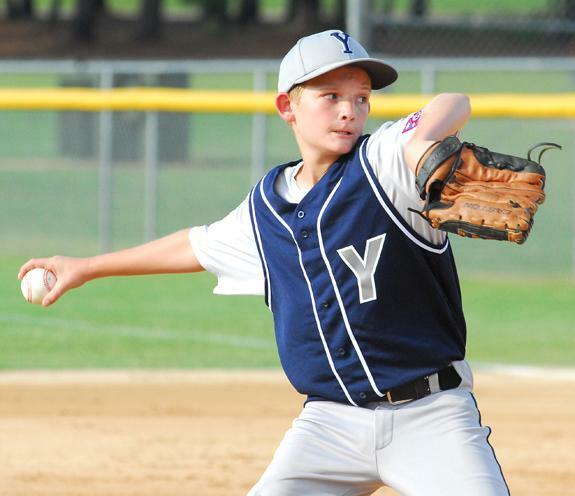 Youngsville defeated Oxford in Monday’s finale at the Warren County Park and advances to the state tourney in Dunn. Oxford shortstop Drew Fisher (with ball) registers a force play Monday against Youngsville’s All-Stars. LOUISBURG — A foreclosure sale of a Franklin County golf course has been postponed, again. First Citizens Bank began foreclosure proceedings in February against the owners of Bull Creek Golf Course. They owe a nearly $800,000. A sale was scheduled to be held at the Franklin County Courthouse on Tuesday, but the bank, which holds the note, agreed to postpone the matter until Aug. 11 at 11 a.m. 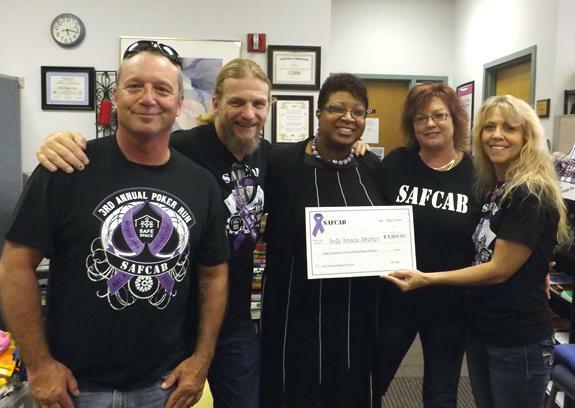 Safe Space Inc. was the special recipient of a check for $8,900 from the SAFCAB Club of Garner, which sponsored the fourth annual SAFCAB Poker Run and Benefit on May 31. The Poker Run started at Ray Price Harley Davidson in Garner and finished at the Lock and Loaded Grill. The event included local vendors, a dunking booth, raffles, local bands and BBQ plates available all day. 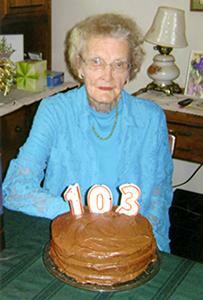 Mary Williams, 103 years young! Mary Williams celebrated her 103rd birthday with 40 family members, nieces and nephews on Saturday, June 7, at the Berteen Wilder family cabin. 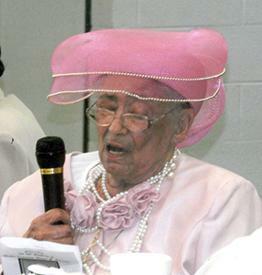 She was born June 14, 1911, the daughter of Brooks and Talitha Benton Heading. She has one daughter, Jean Lloyd (Ned); two grandsons, Greg (Rhonda) and Tim Lloyd; and five great-grandchildren, Scottie, Heather, Mary Catherine, Aaron and Nicholas Lloyd. On Saturday, May 31, the Green-Hawkins families of Louisburg celebrated their third annual reunion and the 95th birthday of its oldest living member, Florine Green Edgerton. RALEIGH — Franklin County’s unemployment rate has climbed, but it remains below the state’s rate. The North Carolina Department of Commerce — Labor and Economic Analysis Division released the statistics for May — the most recent available — and of the 29,220 people making up the county’s work force, 1,863 of them are unemployed. That calculates to an unemployment rate of 6.4 percent — which is .2 percent points lower than the statewide average. Cooperation gets good things growin’! 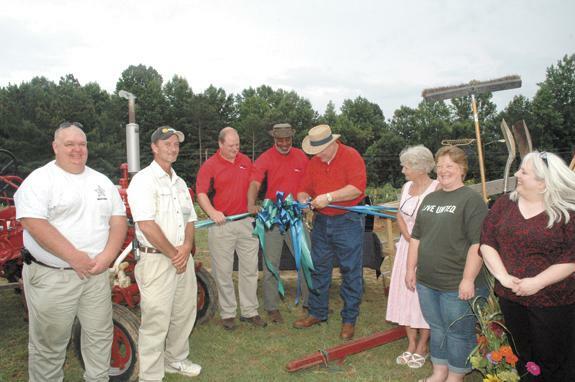 LOUISBURG — Potatoes, tomatoes, corn and plenty of other produce have sprouted from seeds planted at the Franklin County Sheriff’s Office. They aren’t the only things, though, that have grown from a partnership called the United Way of Franklin County Community Garden. LOUISBURG — A Louisburg man was sentenced to more than two years in jail for his role in an armed home invasion. Quandrea Wilson faced more charges and jail time, but prosecutors reached a plea agreement once a witness’ identification of the suspect fell apart.